I’m the type of person who racks my brain forever before I can think of anything decent to make my family and friends when we’re having a party or get together. Or better yet, I put off meal planning as long as possible until I find myself at the grocery store rushing around in a flurry, desperately throwing things into my cart. You’d think meal planning would come easy to me given how many hundreds of recipes I have made over the past few years, but unfortunately that’s rarely the case. Plus, don’t people have expectations when you have a recipe blog? Bloggers, do you agree? Or maybe they don’t care and I stress about these made up things in my mind, which I like to do. It’s also possible that I’m just burnt out on the creative front by the time Friday evening rolls around and the thought of throwing a bag of chips on the table sounds very appealing. Either way, I spent a long time thinking about what to make for my party this past weekend. And you know what’s funny? These pizza bites weren’t on the menu. Nope. This was the product of my hungover creativity on Sunday morning. Go figure. Have you ever made your own tortilla bowls? It’s such a fun technique that looks impressive but is really easy to do. I saw this idea on Pinterest last year and filed it away for the perfecttime (note: a day late, but who’s counting). Basically, you can make all sizes of crispy tortilla bowls, depending on the mold used. For this one-bite pizza, I used a mini cupcake tin, but feel free to use regular-sized tins if need be. It might turn into a 3-bite pizza though! You can also make big bowls and homemade taco shells, both of which I plan on trying out soon. My mind is just spinning with ideas and thankfully no longer spinning from the tequila shots on Saturday night. I used a cookie cutter to make circles (I got 8 circles per tortilla) and then I pushed one circle into each cupcake mold. No need to grease the tin- they pop right out after toasting. I toasted them for 12 minutes at 375F and they were perfectly crisp and golden! 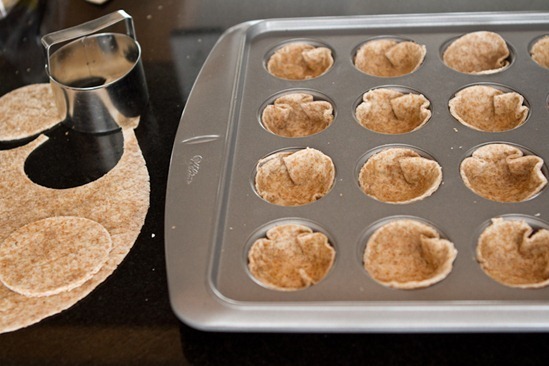 If you want to use a regular-sized cupcake tin, just cut the tortillas into quarters. While those were baking, I got to work on my pizza sauce. Initially, I was going to use store-bought pizza sauce, but then I decided to make a “loaded” pizza sauce which was much more fun than anything I could’ve found at the grocery store. I loaded this pizza sauce with vegetables like red pepper, sweet onion, garlic, cremini mushrooms, and herbs like fresh basil, oregano, and thyme. It’s so good straight from the bowl! 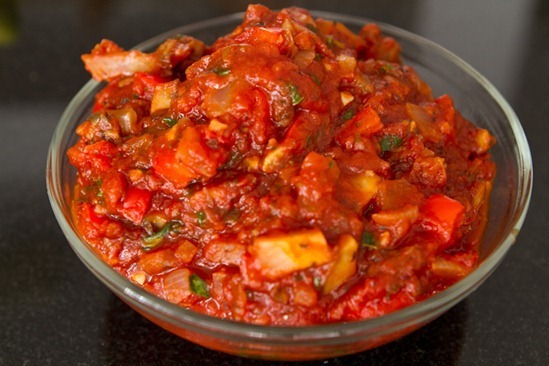 For the base, I used a 14-oz/398 ml can of Eden Organic Crushed Tomatoes and a few tablespoons of tomato paste. Once the sauce was made, I scooped a bit into each toasted cup. Followed by a sprinkle of Daiya cheese. One of my homemade cheeze sauces would also be nice! Then, I broiled it on high for a couple minutes until it bubbled. You know, it’s a good thing I didn’t make these for my party because it would’ve been really hard to share. In no time at all, we devoured almost the entire batch, save for a few that I left in the fridge for cold “leftover pizza”. Yes, it’s as good as it sounds. I suggest serving these warm out of the oven, but you’ll be happy to know that the crispy tortilla bowls didn’t turn to mush after sitting for a couple hours in the fridge. They hold up very well and taste incredible straight from the fridge, cold, like leftover pizza! Have fun playing around with the toppings and mix-ins. Just like a regular pizza, it’s very versatile depending on what you have in your fridge. Feel free to use the loaded pizza sauce on a regular pizza too! 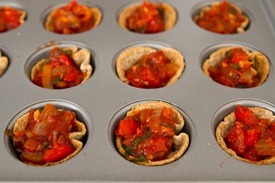 For the tortilla bowls: Preheat the oven to 375F and grab a mini cupcake tin or a regular sized tin. No need to grease it as they will pop right out. With a cookie cutter (or even kitchen sheers), cut 2.5-inch circles out of the wraps and push into the mini cupcake molds. Repeat for the rest & save the scraps for later. Toast at 375F for 10-12 minutes, watching very closely. They should be golden and crisp, but not too brown. 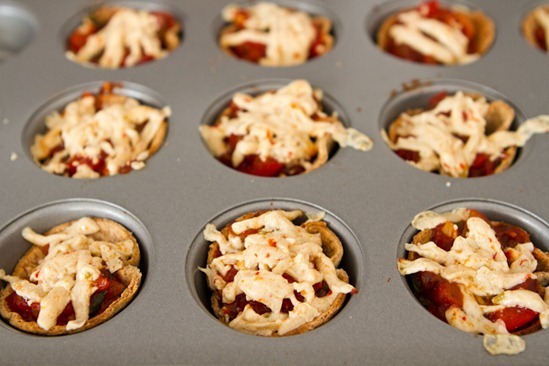 If using regular-sized cupcake tins, cut your tortilla into quarters and push one into each mold. Cooking time may vary if using larger cupcake tins. For the sauce (skip if using store-bought): In a large skillet, heat the oil over medium heat. Now add in the chopped onion and garlic, and sauté for a few minutes, reducing heat if necessary. Add in the chopped mushrooms and red pepper and sauté for another 8-10 minutes over medium heat. 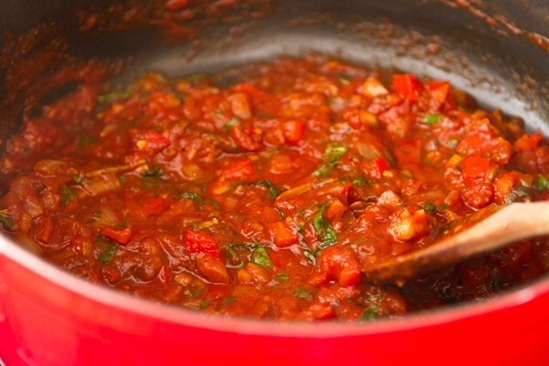 Now stir in the crushed tomatoes and tomato paste, along with the basil, oregano, and thyme. Reduce the sauce and simmer for about 10 minutes until thickened. Season with salt and pepper to taste. To assemble: Preheat your oven to the highest broil setting. Add a couple teaspoons of pizza sauce into the center of each bowl. Sprinkle with cheeze and place into the oven to broil on high for 1-2 minutes, or until the cheeze bubbles a bit. Watch very closely or it will burn. Serve warm! Rip the scraps up into small pieces and place into a bowl. Stir in 2 tbsp of maple syrup, 1/4 tsp cinnamon, and a pinch of nutmeg. Bake on a lined sheet at 350F for 8-10 minutes, stirring once halfway through. You’ll be left with sweet chips that taste just like Cinnamon Toast Crunch cereal. Oh yeah! I go through the same mental blank anytime I have to either bring something somewhere or host a party. It’s like I’m only capable of 1 dish here and there, putting together a “menu” of any sort completely throws me off. Plus, the stuff I like to make at home is not necessarily always a “crowd pleaser” to our friends who are of the chicken nugget and pizza mentality! I was wondering what you were going to use the remaining tortilla scraps for. That’s fracking brilliant! Love Cinnamon Toast Crunch! BTW, made your make ahead steel cut oats last night for breakfasts this week, and this morning I topped it with homemade strawberry jam (leftover from my sister’s birthday cupcakes) and it was WONDERFUL! Thank you for so many wonderful recipes! Oh these are so cute! I can imagine that for someone with your success putting together a perfect party menu would be difficult/an expectation because your recipes are so great and innovative that your readers (and I’m sure family and friends) would be like, “What will she come up with next?” But after all, it was your day (birthday correct? Happy Birthday!!) and what matters is celebrating YOU :) The pizza sauce looks great! I love the idea of putting so many things in it. I could eat those for breakfast (as I am reading this i the morn). LOL. That loaded pizza sauce looks fabulous, too! BTW, loving your header, too! Looks like a winner Angela! YUM! Do you think Ezekial Tortillas would work? They are so thin and break so easily! What kind did you use? I used Casa Mendosa brand Tortillas…super soft! I’m not sure if Ezekial brand would work, but it would be worth a shot! 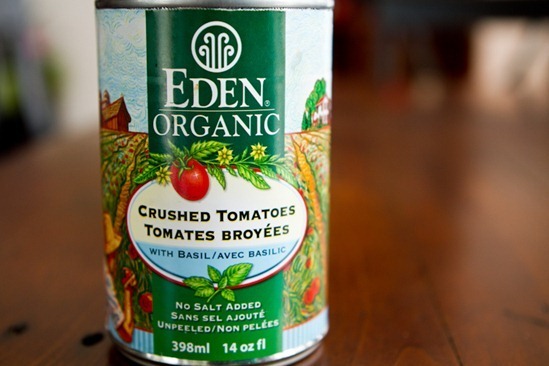 I noticed that you use the Eden brand of canned tomatoes–is that because Eden has the BPA-free cans? My fiancé just informed me about the BPA in cans, and now I’m wondering how I’m going to make chili next winter without canned tomatoes! Eden has some BPA free cans for beans, but I dont think this can is BPA free (dont quote me on that one though!). You can buy tomatoes in jars in many grocery stores now too. I would suggest keeping an eye out for those. Eden has crushed tomatoes in an amber jar. It is the only tomato product available in jars, as far as I know. I wrote to Eden a few months ago. They have tried jars with other tomato products, but they don’t hold up. The crushed tomatoes in a jar are available at my local metro, or lots of health stores. I hope you enjoy them Wendy! Feel free to play around with the recipe..you really can’t go wrong. Thank you, Angela :) I will! 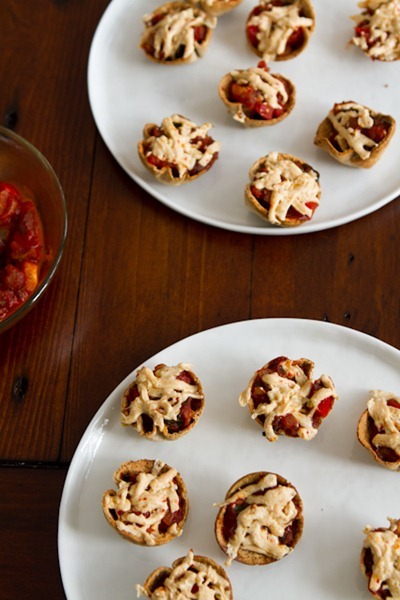 I used to eat a lot of bagel bites as a kid….I wouldn’t touch them now, but these look like the perfect solution to a healthier bagel bite! These are too cute! I love bite-sized foods. This would make a great party food! I do the same thing before parties and my typical go-to which I made in 20 minutes before a barbecue last night in fact is a simple tomato, mozzarella, basil and olive oil salad. It’s a crowd pleaser (in the summer when its all so flavorful) and doesn’t take much mental work haha. I actually just got back from the store and now have to run back out immediately to make these! heh…doh! That happens to me all the time. You are so smart for doing that! Have you ever made your own tortillas?? Living in south Texas, I am going to have to try one day. I just won’t be able to use a press… i think a roller will have to suffice. I found another vegan food blog the other day and i would like to share it with you. She has some neat recipes. These look amazing!! Going to make them this week for sure. That pizza sauce looks incredible!!! And I love the tortilla bowl idea! I can see myself making taco salads in a bowl like that! Yum! Just curious..what brand of tortillas do you use? This one was Casa Mendosa brand….very soft. Hope you enjoy them! A creative recipe! 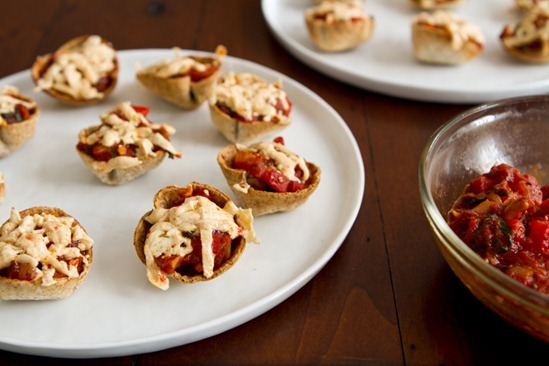 I love how you made the tortilla shells…so easy! Why didn’t I ever do this before? 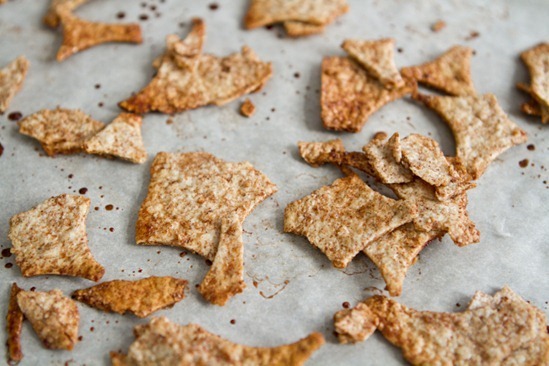 Also, I love making cinnamon + sugar chips…the smell alone is heavenly. This is an awesome hangover food indeed! 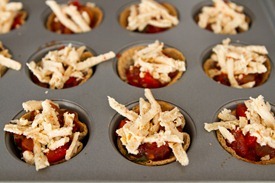 I often use wonton wrappers as little baked cups, but I’ve never thought of using tortillas! You could make some cute little taco bites too I’m thinking! I’ve been meaning to try the wonton wrappers before, will have to try that too. Yes taco bites, pesto bites, dessert bites…I have so many ideas. The sky is the limit with these babies! Okay, this is nothing short of BRILLIANT. 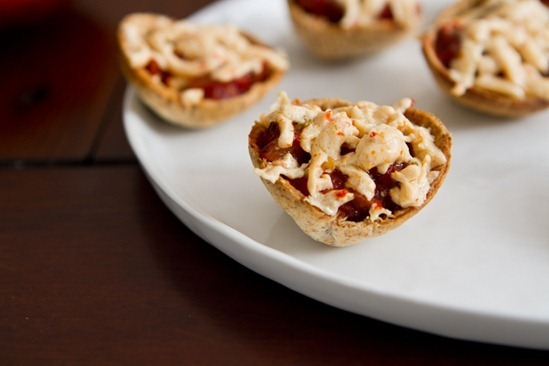 I was looking for something teeny, elegant and savoury to have for my Diamond Jubilee Tea party – and these are perfect. These look great! And my boys (5 and 3) may actually eat them too! It’s so hard to get these kids to eat their veggies (they still love chicken nuggets and hot dogs….trying to find those alternatives for cheap still), but they love pizza. I will have to blend the sauce because if they see individuall veggies in it, they won’t eat it. Crazy, I know. Thanks for the recipe! Blending the sauce is a great idea! These look delicious! We don’t get tortilla wraps here, can anyone suggest an alternative? Maybe something I can bake from scratch? Someone else said they use wonton wrappers. Can you find those? Or what about pita pockets? Thanks so much! I don’t know how I missed that tortilla recipe before. I’ll definitely try it out & let you know how it goes! And love doctored up jarred sauces. A great starting point, and then…all the add-in’s and personal touches. Perfect! These look delicious! LOVE the new header! Yes, please do and goodluck! What a great idea! Love the loaded pizza sauce, too – even when I use store-bought I always end up adding a bunch of my own veggies to it. oh my gosh, this is brilliant! 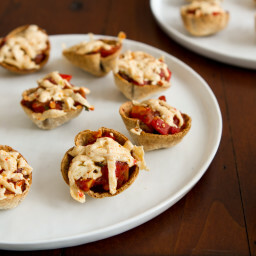 I used to love eating those frozen mini bagel bite pizzas, but these look even better! Awesome sauce!! Thanks for sharing…plus what to do wth the leftovers- brilliant! It’s so funny, I saw your post on Facebook I think where you were editing these pics, and from that small image I thought these were cookies for some reason. So I was confused when I clicked on the post and it said “pizza”. I was like, huh? so funny how we can get something stuck in our minds for no good reason! Maybe I am just too much of a cookie monster – I see them everywhere I go haha! I have been in such a pizza mood lately! I love this idea:) And your pictures always make the food look so amazing! Mmmmmm, this looks so delicious! Well thats also a really nice idea! Just to use tortillas, then u’ll get the nice thin dough! This is perfect! I have a friend coming over for dinner tomorrow and didn’t know what we’d have…putting this on the list! 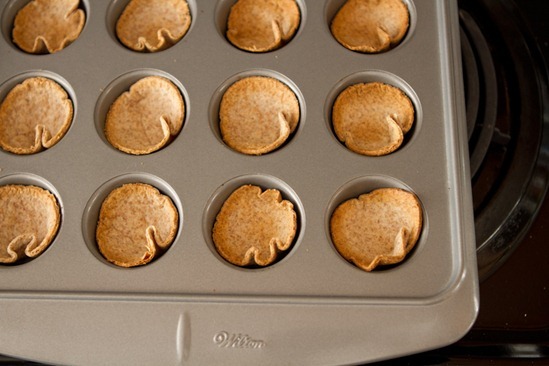 I just made mini apple pies in muffin tins–I love mini food! These sound amazing!! Definitely bookmarking this recipe, and hopefully I’ll remember it for the next time I have people over. And I really love that you have a solution for the leftover scraps, too – I was wondering about what could be done with them when I saw your picture of cutting out the circles. So perfect! I’ve made “bowls” like these for taco salads before. But I love these mini versions! This looks like such a perfect party food. Hi Angela, this sauce looks so good! It’s hard to find a good pizza sauce recipe. hope you enjoy it Lauren! What size was the cookie cutter you used to cut out the circles? What was the diameter? SUCH a cute idea!! I absolutely LOVE this! Hi Angela, can I use brown rice tortillas or corn tortillas? My daughter is gluten intolerant. Also, what if the broil doesn’t work, which is the case with my oven. Can I just bake it for a few more minutes? I used the brown rice, enjoy life brand and they worked perfectly. oh that loaded sauce – looks so rich and vibrant! So what kind of tortilla shells did you use? Were they GF, corn ones? Would corn ones work? And I repeat, mmmm pizza. That. Is. Awesome. 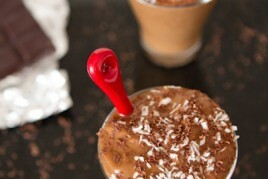 yumyumyum i will totally be making these what an awesome idea! This is why I love your blog: even when nursing a painful hangover (ie tequila- triggered) you still come up with the most amazing ideas! 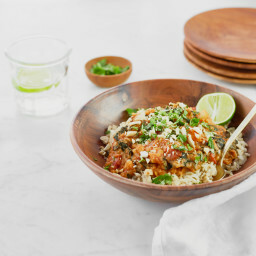 I can’t wait to make these for dinner! Yummm these look awesome. Do you have calorie count for these? Im sorry I dont have the calorie count for these. I made these last night and they were sooo good!! I used wheat free tortillas and cut them with a measuring cup, and it worked perfectly! I also added meat to my sauce :0) my boyfriend had a permanet smile on during the whole meal! Thank you for inspiring dinner creations! This looks wonderful! I love them snacky/healthy recipes. I wanted to ask you, where did you get your treadmill? I don’t live in Canada, but I am getting into running and I wonder what I will do during those winter months….thanks! These look delicious!! Like healthy little bagel bites, but yummier! Fabulous idea! Thanks for sharing! This is such a fun idea for a party!! I will definetely try the sauce! Can’t wait to make them for the fam. Look delicious. Yum. 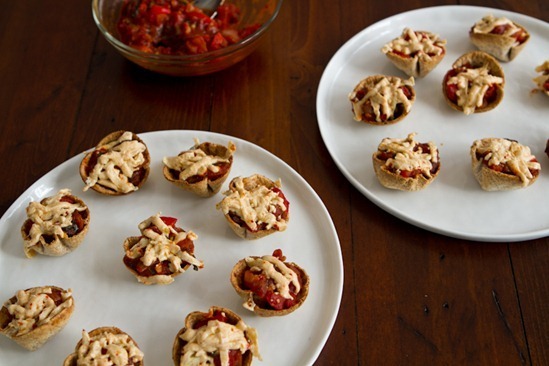 I love this idea, especially the little tortilla bowls! Do you ever use Rice Cheese instead of Daiya? The guys at Whole Foods ALWAYS try and sway me to Daiya when they see me buying Rice but I think that it tastes SO much better! My omni-boyfriend loves it too, and he won’t touch Daiya! What a wonderful idea… and tasty too. Think this would be a great project for my grandchildren and me to do together… They will like them! Thanks for great ideas. These were so easy and so good. 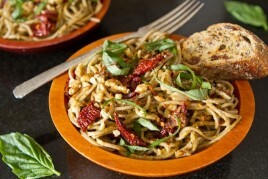 A great way to use up an extra bowl of roasted vegetables that were sitting in my fridge for a few days. I did find that since I refrigerate my tortillas, while they are awaiting meal inspiration, that they stayed in the mini tins better if I zapped them in the microwave for a second before forming them into little cups. My daughter gobbled these up. I’ve bookmarked this recipe into my “future lunchbox ideas” folder. Perfect for sending to school on a regular “pizza day” for my little plant-strong eater. 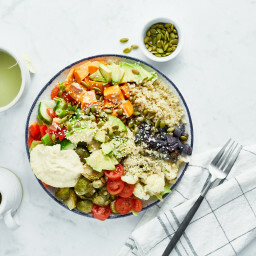 Hi, is there somewhere I am missing on the recipe pages that lets you know the calorie/fat per serving on the recipes? I occasionally post the nutritional info on recipes, but its not the norm Im afraid. Sorry about that Tracy! I transplanted myself from the states to the UK to be with my husband. He’s a vegetarian, and so now too am I. It’s not as hard as I thought, but we love potatoes and bread – and without a large répertoire of vegetarian recipes I’m losing the waistline battle. I look for recipes everywhere, so I’m excited to find your blog. We’re always making each other snacks around 8 or 9 at night, as we cuddle up for a movie. Well! I plan on surprising him with these tonight. He’s going to be so impressed, and I’m going to reap lots of ooohh’s and awwww’s for my ingenuity and just plain awesomeness! Thank you! I hope you both enjoy them Mar! I have the same problem – it takes me forever to decide what to make for dinner parties and for guests. I sometimes wish that I had a standard “go to” dish that I was known for but I hardly ever make the same thing twice and am constantly woo-ed by new recipes that look good. Your blog only contributes to my problem btw – not that I’m complaining since everything I’ve made has turned out great! 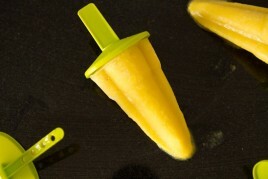 :) Looking forward to making these for my next cocktail party. i’ve made these twice now, so good and SO quick and easy. LOVE THEM! every make these with mexican style ingredients? No I havent but that sounds good! Just made and ate this. So amazing. Your recipes make my life so much better!! Thank you!! I can’t wait to try these but do you know if they freeze well? theses look great, I’d love to use them for my daughters lunch for school. Are they freezer friendly? I made this sauce for my homemade calzone and it was deeeee-licious! Next post: Chocolate Covered Strawberries from Scratch!